The Communication Workers Union, which represents staff at the Royal Mail that are postal, has condemned plans by the Royal Mail to employ 30,000 temporary employees to deal with the back-log created by union members working even less than normal. Union workers are objecting plans by the Royal Mail to drag the institution into the 21st century. They fear that increased automation is likely to lead to job losses and a chance that your letter might get to the correct address, rather than just ending up in the first house on your street that the postie passes. Other modernisation plans involve a radical scheme to have the sorting office check the intended address against it's own comprehensive database of possible addresses before handing it to a bloke on a bike who, if confused, will just deliver it somewhere that looks a bit like it. People across Britain are believed to be taking no additional precautions to allow for the thousands of items of post that will become lost, damaged or stolen during the postal crisis. As most believe they will see no difference to normal postal service. 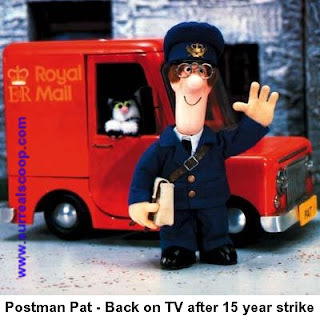 "staff at Royal Mail that are postal"! Hee hee - priceless.